Malkus is an Orc vampire found in Forebears' Holdout. He ambushed the Moth Priest Dexion Evicus south of Dragon Bridge and took him to Forebears' Holdout in an attempt to enthrall him. On the body of a dead vampire near Dragon Bridge, you will find a note from Malkus. A letter from Lord Harkon explains why Malkus kidnapped Dexion, although it is not found in the game. 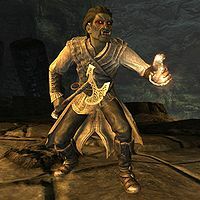 If one sided with the vampires, then he will be found dead next to the magical barrier, slain by the Dawnguard agent Vanik. Malkus wears a set of light gray colored vampire armor with a Fortify Destruction enchantment, and a matching pair of boots. He is equipped with a leveled one-handed weapon which can be up to elven quality. He carries random leveled bandit loot, as well as a 25% chance of carrying 1-9 gold. He also carries the special Weystone Focus used to create the magical barrier that keeps Dexion imprisoned. Malkus: "The more you fight me, the more you will suffer, mortal." Priest: "I will resist you, monster. I must!" Malkus: "How much longer can you keep this up, Moth Priest? Your mind was strong, but you're exhausted from the struggle." Malkus: "Yes, I can feel your defenses crumbling. You want it to end. You want to give in to me. Now, acknowledge me as your master!" Malkus is a member of the bandit wizard class, which determines the level of his skills. He is the only vampiric Orc in the entire game. Although apparently a member of Lord Harkon's court, you will never encounter him before the quest if you sided with the Volkihar vampires. This page was last modified on 3 September 2018, at 23:57.